Our Saint Augustine bed and breakfast is on historic Charlotte Street, which puts the Florida city's 500 years of history right outside your door. You are in the ideal location for discovering the city's wonderful restaurants, shops, and attractions. 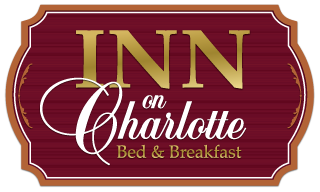 Inn on Charlotte is committed to making your visit both easy and comfortable. That is way we offer shampoo, body wash, and hand soap in your private bathroom. Consider taking a shuttle to our Saint Augustine bed and breakfast because we are in the middle of most everything there is to see and do. And what you can't walk to, we sell Old Town Trolley Tickets to get you there . Looking for a great restaurant? Maybe its a cool place to hear some music after dinner, or a porch to puff on a cigar? This is the village for you. Hurry and book your room today. "—you'll find classic hotels and intimate restaurants... What sets Saint Augustine apart is its history—it's the oldest European settlement in the U.S. And nowhere else in the world can you taste the waters of the Fountain of Youth Archeological Park (where Ponce de Leon may have landed). Who knows, if you vacation here, maybe you won't need that Botox! " Let us give you the perfect bed-and-breakfast experience. Renew your mind and relax your soul. Come and find out for yourself why Ponce de Leon believed St. Augustine to be the source of the Fountain of Youth. A carefree vacation awaits. Situated on Northeastern Florida's Atlantic Coast, you can also enjoy an afternoon of sailing, deep sea fishing, or just floating along on one of our relaxing scenic bay cruises. If you'd like to spend some time at the beach, you are just 3 miles from Anastasia State Park which boasts 7 miles of the Sunshine State's finest beaches. The Inn on Charlotte also offers great Add-on packages for your stay in St Augustine Fla at this Florida bed and breakfast. Saint Augustine Historic Inns is a trade association of over 24 real B&Bs in the nation's oldest city.